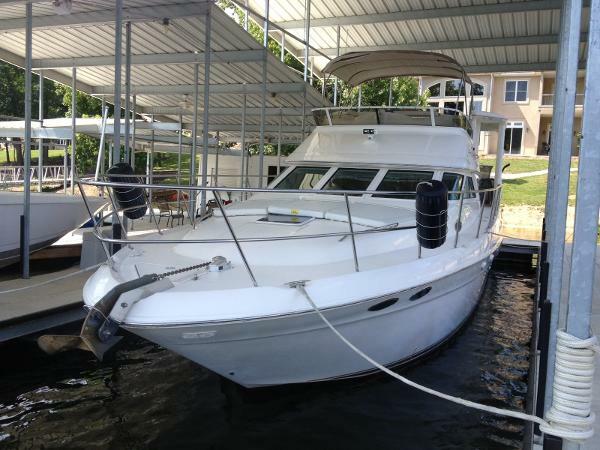 1997 Sea Ray 420 Aft Cabin 1997 Sea Ray 420 Aft Cabin - Wonderful "Live-aboard"!! 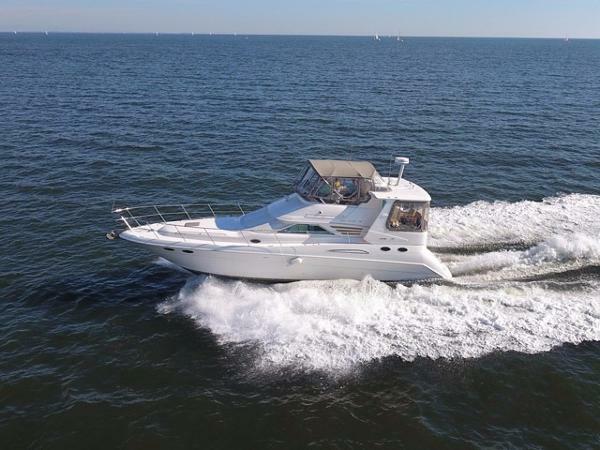 Creative styling, a spacious interior, and quality construction made the 420 Aft Cabin a popular yacht in the Sea Ray fleet during her production years. Aft-cabin yachts often look more like condos than boats, but the sleek profile of the 420 speaks volumes about Sea Rays ability to incorporate European styling influences in an American-built yacht. Built on a fully cored hull with propeller pockets and underwater exhausts , the 420 has more interior space than seems possible in a yacht her size. The galley is down, which allows space in the salon for an L-shaped dinette. Topside, a fiberglass panel surrounds the aft deck, and molded steps descend to the wide swim platform. Extra features include a spacious flybridge, wide side decks, radar arch, transom storage chamber, and an aft deck wet bar. Boat has many upgrades like all new carpet in the interior and exterior. Brand new Raymarine GPS/Plotter/Sounder combo unit. Raymarine auto pilot. This boat is extra clean and turn key ready for her next owner. 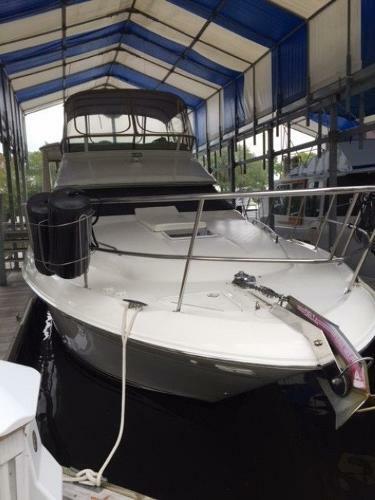 2001 Sea Ray 420 Aft Cabin The Sea Ray 420 Aft Cabin features twin 454 Magnum MPI Horizon MerCruiser inboards. Her luxurious appointments, spacious accommodations, and superb seaworthiness provide a cruising environment that will please the most discriminating yachtsman. 1999 Sea Ray 420 Aft Cabin 1999 SEA RAY 420 AFT CABIN w/ Twin 380hp MerCruiser 7.4L MPI Horizons Only 521 hours. 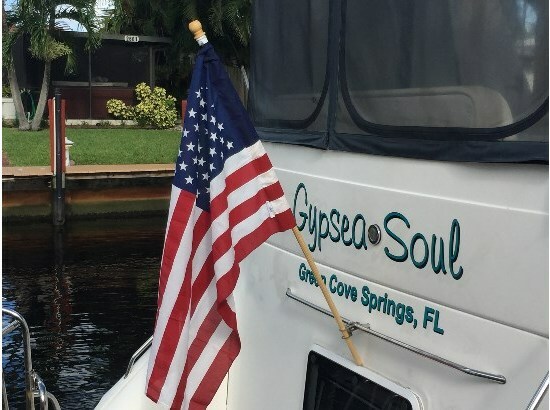 This boat is stunning and has been meticulously maintained since day 1! 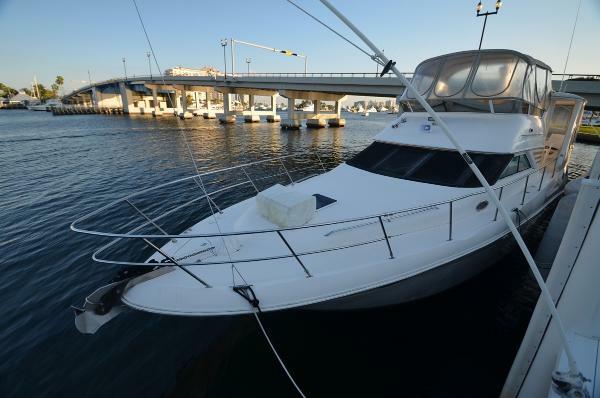 The current owners have pampered this boat and have spared no expense in taking care of her. It's been moored in a covered slip on the fresh waters of The Lake of the Ozark's it's entire life. Three stateroom floor plan. Fresh bottom paint, buff and wax, new Kohler generator in 2016 and engine services are up-to-date. This truly is a "Turn-key" boat. Upgrades include new flat screen TVs throughout and Bose Sound System. 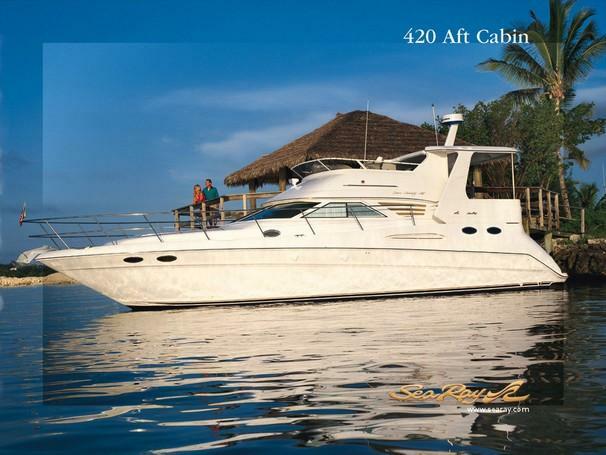 Her spotless interior and exterior make her one of the nicest 420 Aft Cabins that you'll ever find. Pride of ownership really shows. SHE'S TRULY A MUST SEE!Creative styling, a spacious interior, and quality construction made the 420 Aft Cabin a popular yacht in the Sea Ray fleet during her production years. Aft-cabin yachts often look more like condos than boats, but the sleek profile of the 420 speaks volumes about Sea Ray’s ability to incorporate European styling influences in an American-built yacht. Built on a fully cored hull with prop pockets and underwater exhausts, the 420 has more interior space than seems possible in a yacht her size. The three-stateroom floorplan is arranged with double beds in the fore and aft staterooms, while the second guest stateroom extends under the salon sole. The galley is down, which allows space in the salon for an L-shaped dinette. Topside, a fiberglass panel surrounds the aft deck, and molded steps descend to the wide swim platform. Additional features include a spacious flybridge, wide side decks, radar arch, transom storage compartment, and an aft deck wet bar. 1998 Sea Ray 420 Aft Cabin 1998 Sea Ray 420 Aft Cabin. St. Croix River since new. We are the second owners. Always in a covered slip and buffed annually. Exceptional condition. Eisen glass is crystal clear. Marina staff maintained. Horizon (7.4 MPI Gas, 380 HP) engines at approximately 700 hours. Two (2) staterooms and a mid utility/laundry room configuration. Storage everywhere. Beautifully polished cherry interior. Two enclosed showers. Hanging closets in each stateroom. Washer/Dryer. Three (3) AC units. Low time generator and separate inverter. Radar. Central VAC. Windless. Locking wing doors. Four (4) flat screen TVs and two (2) Blue Ray CD players. Deck wash down system. St. Croix "Heavy" davits. Aft seating area ice maker. Last survey was 6/2013 when we purchsed. Asking $129,000.00. A package price including the boat, dinghy and slip is available. AB RIB available. Integrated bow storage/seat. Heavy canvas cover. 11' with St. Croix seating/steering assembly, 20 HP Mercury 4 stroke outboard and trailer. Recently constructed COVERED slip in the beautiful Sunnyside Marina is also available. 16' X 50' with fiberglass dock box. This is a single sided slip. Package price available. We are downsizing. 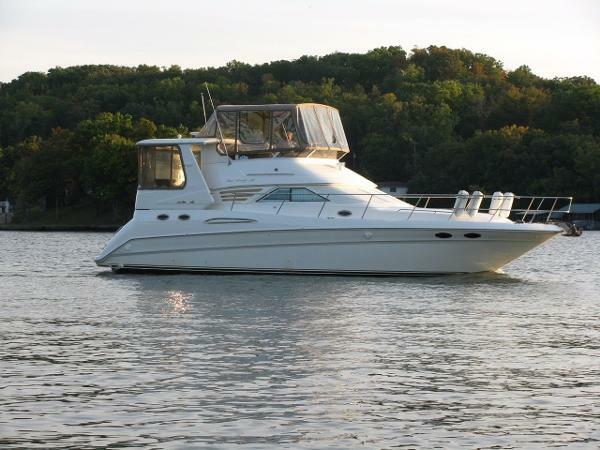 1997 Sea Ray 420 Aft Cabin Beautiful and well appointed 1997 SeaRay 420 Aft Cabin is ready for immediate sale. Twin MerCruiser 7.4 liter Blue Water inboards move this vessel along with a total of 680 horsepower. A Westerbeke 9 KW generator provides the power when not hooked up to shore power. A 60 amp Pro Mariner battery charger keeps the batteries charged. Helm has updated electronics including a Garmin dome radar unit with a GPS map 6212 display. A Garmin multi function display and VHF as well as a Raytheon Ray Pilot 650. Satellite Trac Vision provides continuous tv to the 3 upgraded flat screens in the Cabin. There is a Bose surround sound system in the salon as well. The refrigerator on the Aft deck has been replaced as well has hard word flooring in the galley. This vessel is a 2 stateroom layout with a laundry room with washer/dryer combo. The boat has just been buffed and waxed and will be getting new boot strips and the bottom paint touched up. This is a must see and the owners are very motivated to sell it! 1997 Sea Ray 420 Aft Cabin This 1997 Sea Ray 42 Aft Cabin is a clean boat with a fresh detailing and bottom paint in July 2016. The motivated seller has priced her to sell. 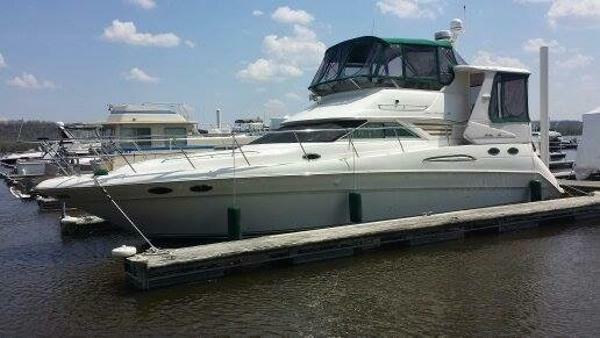 2002 Sea Ray 420 Aft Cabin PRICE JUST DRASTICALLY REDUCED !!!! 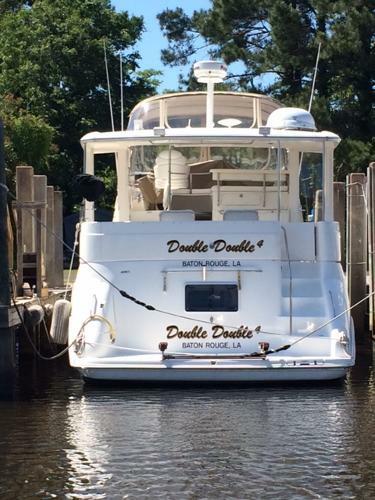 The name 'Double Double' is appropriate for this 42 ft. Sea Ray Aft Cabin. It has Double the comfort and Double the entertainment room. 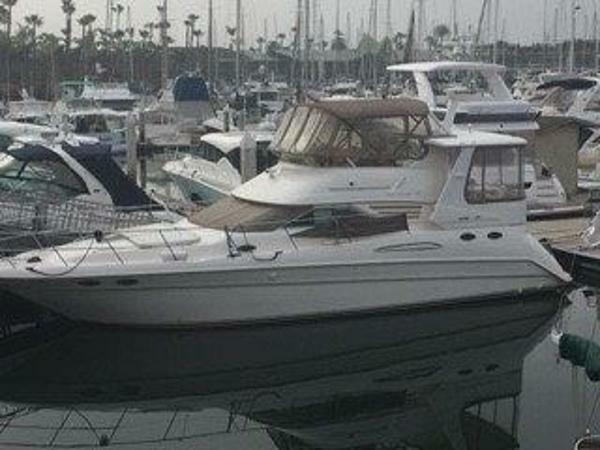 She is also loaded with all of the extras that you will need to go yachting anywhere you want.She has been on our Yacht Maintainance Program and is ready to run. Her current owner is open to all reasonable offers. 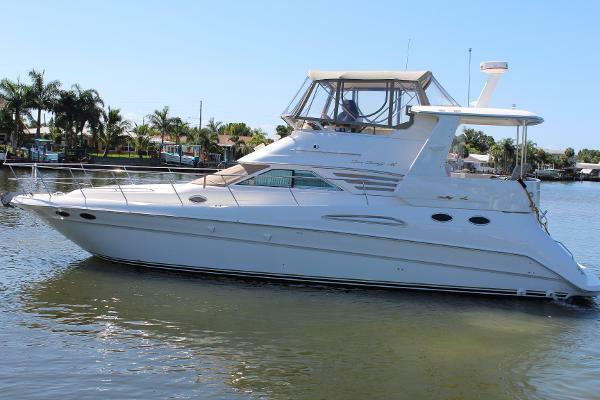 2002 Sea Ray 420 Aft Cabin This well kept AFT Cabin motor yacht has two full cabins, two full heads with enclosed showers, large salon and a full galley. Cruise the bay in this beauty or cruise the coast wherever your heart takes you. This lovely AFT Cabin is ready to go! 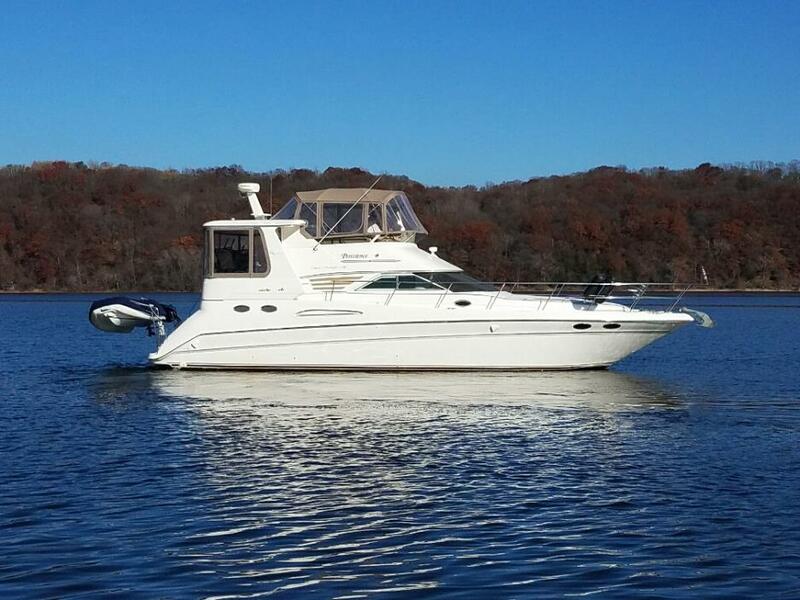 1998 Sea Ray 420 Aft Cabin For Sale: 1998 Sea Ray 420 AC Twin Horizon closed-cooled 380hp MerCruisers with 655 hours, 3 a/c's with reverse cycle heat, 3 stateroom layout, cherry cabinetry, 40" Samsung smart tv on the aft deck, 32" Samsung tv in the main salon, brand-new black canvas enclosures. The bow locker and aft locker water connections have been converted to draw river water for endless water supply. 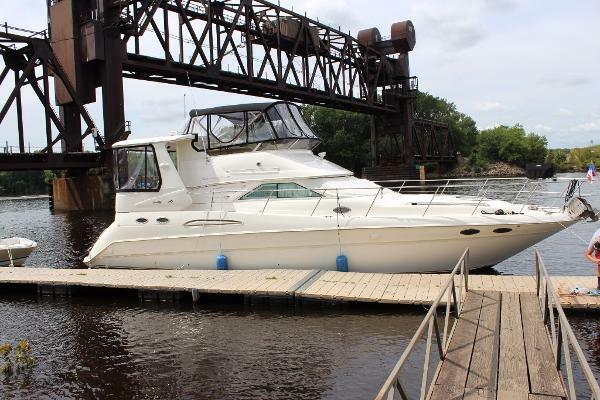 $124,990 This boat has always been in freshwater. I just had both cutlass bearings and water pumps replaced. I spent a lot of money on Tv's, bedding, aft deck furniture, and new canvas as I was planning on keeping this boat for a long time. The boat will run about 30 mph. Houseboat trades are possible. I am looking for a 3+ stateroom house boat in the 52' - 68' range. I would be especially interested in 4 stateroom aluminum hull houseboats like a Majestic, Lakeview, Sumerset, or similar. As well as Skipperliner and 520 Harbor Masters. 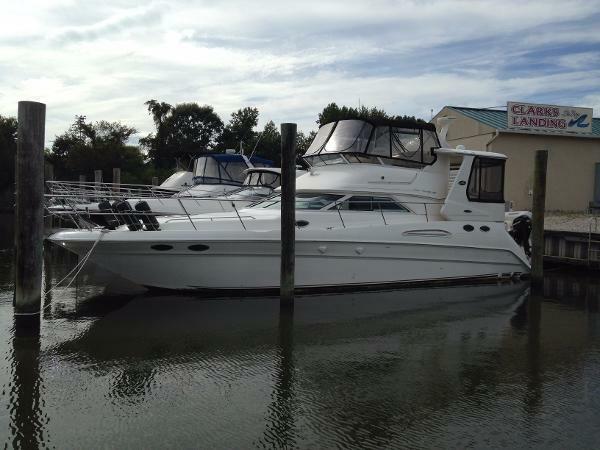 1998 Sea Ray 420 Aft Cabin-3 Stateroom! 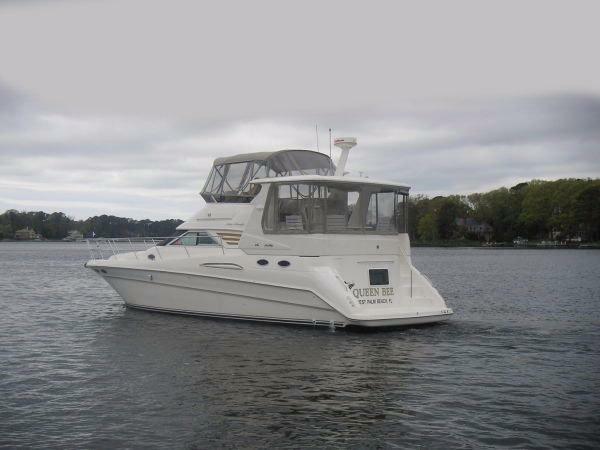 Model 420 Aft Cabin-3 Stateroom!